Wisdom teeth, clinically known as third molars, are the last teeth to develop and appear in your mouth. They come in between the ages of 17 and 25, a time of life that has been called the "Age of Wisdom." 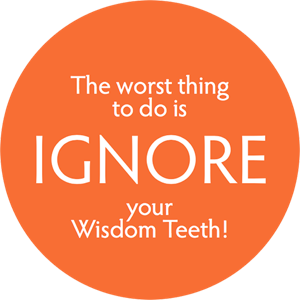 Wisdom teeth are easier to remove when the patient is younger, since their roots are not completely formed, the surrounding bone is softer, and there is less chance of damaging nearby nerves or other structures. Removal of wisdom teeth at a later age becomes more complicated as the roots have fully developed (and may involve the nerve), and the jawbone is denser. When a tooth doesn't fully grow in, it's "impacted" – usually unable to break through the gums because there isn't enough room. 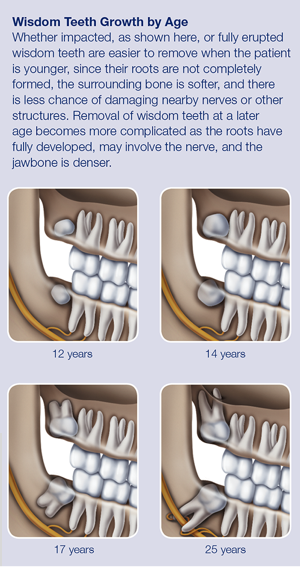 An impacted wisdom tooth can damage neighboring teeth or become infected. Because it's in an area that's hard to clean, it also can invite bacteria that lead to gum disease. Oral bacteria also can travel through your bloodstream and lead to infections and illnesses that affect your heart, kidneys and other organs. In some cases, a cyst or tumor can form around the base of the impacted tooth, which can lead to more serious problems as it hollows out the jaw and damages surrounding nerves, teeth and other parts of your mouth and face.